New year, new you! 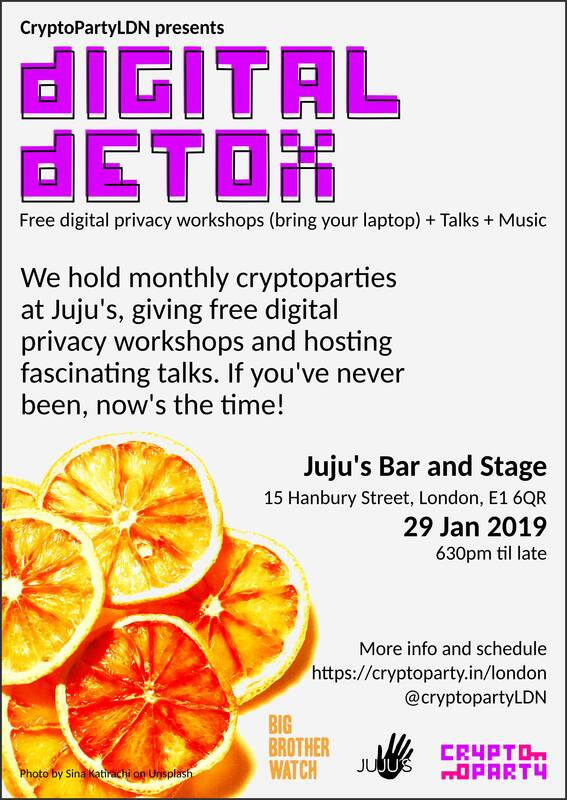 The next @CryptoPartyLDN will be on Tuesday 29th January 2019. We will be at our usual location, the marvellous Juju's Bar and Stage in Shoreditch. Join us there to learn about privacy and digital rights and slim down on your data trail. As always, CryptoParty is free and open to everyone, all welcome! More info on format and schedule to appear here soon. Thanks to all the amazing friends that make this possible - trainers, speaker, DJs, Big Brother Watch, Juju's Bar and Stage, and all the participants! 6.30pm: Let the party commence! @gouttegd Take Back Ctrl What is Nextcloud? Discover new solutions to avoid feeding the data-hungry tech giants such as Google. @rhapsodhy Digital defence Beginner friendly! Digital threats and defence strategies for the Average Person. @spyblog Social Media OPSEC (operational security) Tips on hardening your Social Media accounts from being taken over, or revealing too much - Link to Slides (.pptx) - PLUS the regular Anonymity SwapShop - bring along spare social media accounts, SIM Cards, burner phones, Oyster Travel Cards etc. to swap or barter with other people, to help break the financial and CCTV purchase trails. TBC Data Detox Had a bit too much scrolling over Christmas? Is your inbox polluted? Come to this calming workshop for some very private 'me' time. Expel digital toxins and eliminate those nasty trackers for new year data wellness. 8pm Lightning Talks - 5 minute mind-blowing talks! Johanna and Dean from AdblockPlus How to data detox with adblockers Ever had that moment where you thought about getting this awesome new phone - and all of a sudden you feel haunted by phone ads when browsing? Learn how ad blockers can help you to data detox by protecting your privacy and eliminating tracking. CryptoParties are free and open for everyone, but especially those without prior knowledge, who haven't yet attended one.